Dr Amit Mistry has undergone extensive post-graduate training and education in the field of dental implantology, from the very basic levels to advanced surgical and restorative cases. He is one of just a handful of dentists in the UK qualified to carry out zygomatic surgery, offering life changing options to his patients. He has extensive experience in surgical grafting of bone, plastic surgery of the gums and the provision of teeth on the same day. Attaining the very best possible aesthetic and confidence boosting results for his patients is paramount. Qualifying from the University of Manchester in 2001, and was awarded his Royal College of Surgeons Membership in 2003. Amit further enhanced his surgical training during his time as a junior surgeon and later Senior Grade Surgeon, at Blackburn Royal Infirmary, which is renowned for the quality of its academic and teaching staff in Oral and Maxillofacial surgery. Amit has treated extremely compromised cases such as trauma reconstructions which routinely requiring advanced surgical procedures such as complexed bone grafting. Amit finds teaching very rewarding, he is the lead clinician on the Tipton Training implant course which is one of the best known and largest implant postgraduate courses in the UK. His lectures and hands on training help delegates to master the basics of dental implantology, progressing through to advanced surgical and prosthetic techniques, including sinus lifting, block grafting and full mouth implant cases. As well as teaching, Amit is actively engaged in learning new methods, enhancing established techniques and embracing new technology which will improve the quality of the surgical procedures he does and he regularly passes this knowledge on to the dentists he teaches. 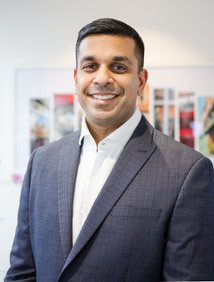 Amit is also a recognised and experienced mentor for Nobel Biocare and is also involved with the Association of Dental Implantology UK (ADI) locally providing support to dentists who are involved with dental implants. Implants are one way of replacing missing teeth. A post is implanted in the jaw bone to support a replacement tooth. This acts like the root of a natural tooth. Implants can also be used to support fixed bridges or dentures. The reliability of modern dental implants has improved so much over recent years that they are often the most permanent solution to replace missing teeth. Implants prevent the bone from shrinking and leave your other teeth unaffected. There is no need to prepare adjacent teeth with drills and attach bridges. It has become possible to replace full and partial dentures simply and predictably with solid and life like teeth, supported by implants. This is the fixed, permanent solution leaving you with no gaps, no dentures, no drilling. Teeth that look and feel like your own once did or even better. 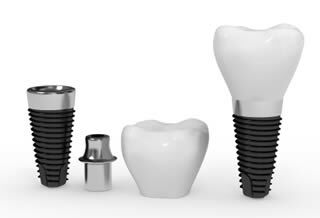 Implants are Titanium inserts that integrate with the bone and act as false roots. We can then use them to support crowns, bridges or dentures. By supporting an individual crown they can replace a lost tooth without having to damage or compromise the adjacent teeth. Where several teeth are lost they can support bridges to restore function and aesthetics without putting stress on the remaining natural teeth. If all the teeth are lost multiple implants can support full arch bridge or special denture work. 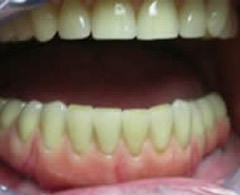 They can even be used with simple anchor attachments to stop a troublesome denture from sliding about or dropping down. Modern implants have a very high success rate to the extent that we are having to rethink our approach to compromised teeth. If teeth are heavily filled with failing root fillings or are becoming mobile because of gum disease it is often better to replace them with implants which have a much better long term prognosis. Current research shows a 98% 5 year survival for modern implants from the 1990s. The implant surface is constantly being improved and changed and this is the reason for the lack of long term results with the most up-to-date implants. It is better to wait until growth is completely finished i.e about 19 years old, but there is no upper limit to the benefits of implants. The main restrictions are whether there is adequate bone to accommodate the implant and if there is enough room between the teeth and jaws to place the crowns / bridgework / denture. It is generally possible to overcome these difficulties either by augmenting, grafting or creating space with simple orthodontics. How can I find out if I can have implants? Implant assessments are carried out by Amit Mistry who will carry out a thorough examination of the proposed site. He will discuss all treatment options using implants as well as conventional treatments to ensure that you can decide which treatment is right for you. Our practice currently charges £125 for a 60 minute assessment (excluding x-rays). We can manipulate images from our full face digital x-ray machine to help determine the best implant sites. You will then be given a written report detailing the findings, alternative treatment options and stages of treatment. Placing implants is normally a minor surgical procedure. It is usually (over 95% of cases) carried out under simple local anaesthesia although sedation or general anaesthesia can be arranged where indicated. The placement is always painless but there can be some discomfort in the days following surgery. If you have good ridges there is very little post-placement pain or swelling. Such patients will usually limit analgesia to taking one or two paracetamol or brufen immediately afterwards. Sinus grafts are often associated with painless bruising in the cheek. Bone graft patients are a little swollen and sore for 2-3 days after surgery. Are implants expensive? Can I have them on the NHS? Implants are not considered to be necessary to achieve oral health and are therefore not available on the NHS except in rare occasions such as after cancer resections or congentital abnormalities. Our practice offers a competitive price of £2,400 per implant and crown replacement. This price can vary if it is necessary to augment the bone. For more complex cases it is better to have an assessment and you will be provided with different treatment options with different costs. Please click the case titles below for before and after pictures and case descriptions. This gentleman from Wales presented requesting a replacement for the upper right central incisor that had recently been extracted because of an abscess. 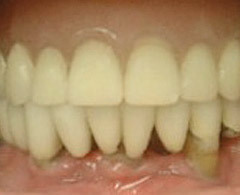 The upper left incisors had crowns with poor aesthetics and the right lateral incisor was twisted. The abscess had caused a lot of bone loss in front of the tooth and this meant that an implant solution would have a slightly longer crown length. Implant placement was delayed to remove the infection. Despite the bone loss, healing was uneventful and a temporary made. The implant was restored and the crowns on the other incisors were replaced with procera, non-metal crowns two months after osseointegration had taken place. 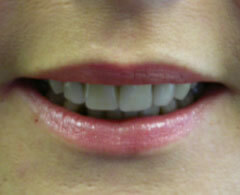 The lateral incisor was veneered to bring it into alignment. The final appearance is excellent. This gentleman's bridge, which stretched from canine to canine, failed catastrophically leaving fractured and infected roots with marked bone loss. The bridge was sectioned leaving the crown temporarily on the right canine (see below). We removed the roots and provided a temporary denture while the infection resolved. The bone loss was rectified with augmentation at the same time as the implants were placed. The four implants integrated well under the denture for two months. 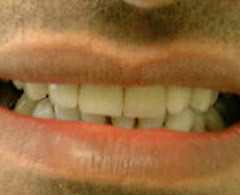 A temporary bridge was then made and worn for a further two months before conversion to the definitive implant supported bridgework (seen left and below). The crown on the right canine was also replaced. The final appearance is excellent and the patient is delighted with the natural appearance. This is the most stable and advanced removable solution for loose upper dentures. The large sinuses in the upper jaw can mean it is not possible to place implants at the back without further surgery. However, with adequate bone it is possible to place 6 implants and join them with a precision made milled bar to which the denture is attached using a perfectly matching female bar connector with special clips. This patient suffered from the premature loss of his upper teeth, which also lead to the loss of the bulk of the supporting bone. This meant that there was little ridge to support an upper denture. 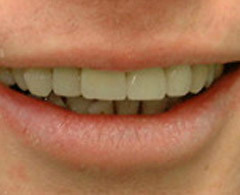 He is an active businessman and needed the confidence of a stable and aesthetic upper prosthesis. We allowed 6 months after extractions to clear the infection before placing six implants. These integrated uneventfully and the precision bar was constructed joining the implants, implant retainer bar. 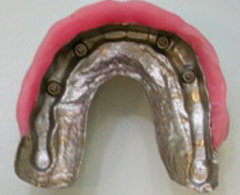 The special clips can be seen clearly in the denture. This type of denture support has all the advantages of removable restorations i.e. provide lip support, possible to cut away the palate allowing the patient to taste his food, as well as feel the texture and heat, easier to repair or replace the plastic components that wear with time. It is not absolutely fixed but is nevertheless very stable and retentive. It has hugely increased the quality of this gentleman's life. 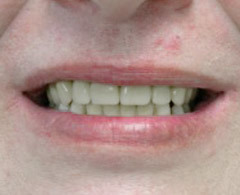 Note the natural appearance of the finished denture and the confidence of a satisfied patient. Many patients are unable to be without their teeth while the implants integrate. We have been providing "same-day teeth" for several years and have experience with three different implant systems using this technique. This gentleman has had the benefit of bridgework for many years that has now failed and could not be replaced. He wanted a fixed alternative to dentures and even a temporary denture was not an option given his busy lifestyle and commitments. We carefully removed the remaining teeth and placed 7 Straumann implants and a temporary bridge at the same visit. The final bridgework (by Richard Noar) is excellent and the patient is delighted. Many patients do not want to have to wear a denture while their gums heal after extractions and before they are ready for implant placement. The All-on-4 technique from NobelBiocare overcomes this by allowing us to fit a fixed bridge on the same day the teeth are removed. 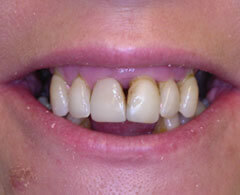 This lady had excellent oral hygiene but was losing her teeth to gum disease. 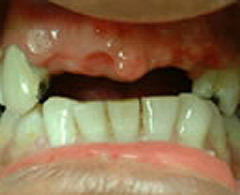 The centre photo shows her on the same day that the teeth were removed and the temporary bridge was fitted. The final photo is of the definitive bridge which is fitted after 4-6 months. In her case this was of acrylic teeth on a Titanium framework. 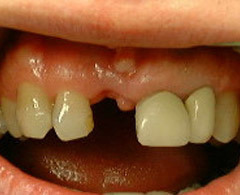 The lost lower front teeth were replaced with a four unit bridge on two implants. The patient and the team are delighted with the result. Nobel Biocare’s™ ground-breaking All-on-4 system has been developed to maximise the use of bone available and to allow for immediate function. It uses four implants, placed at an angle to provide a secure support for a prosthetic bridge, even in cases where there is minimal bone available. It is ideally suited to patients who are edentulous, have terminal dentition due to caries or periodontal disease, or who wear dentures. Conversion to definitive 12 unit bridge after 4-6 months. The science of dental implantology has improved so much in recent years that we believe an implant is often the treatment of choice to replace a missing tooth without harming the adjacent teeth. There are a few elite implant systems with long-term scientifically proven products and techniques such as Branemark (Nobel Biocare), ITI / Straumann and Friadent / Xcive. These have now been joined by several other companies notably Dentsply / Degussa (Ankylos) and Astra.